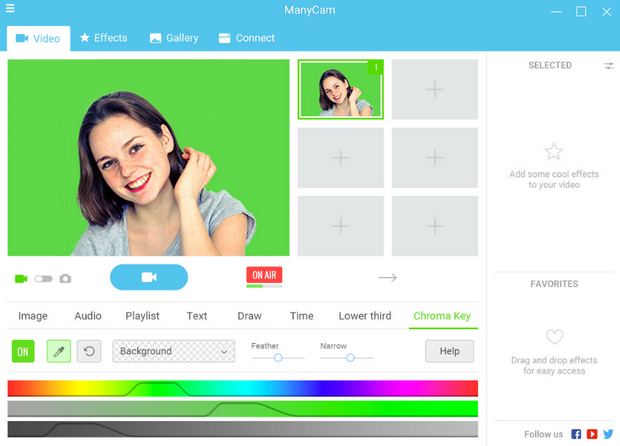 This program is called "ManyCam". It free webcam effects software turns your webcam and PC into a live video studio. Use your webcam with multiple apps simultaneously. Broadcast your desktop or draw over your video window. ManyCam also allows creates awesome audio sound effects. ManyCam's built in Studio Pro live webcam switcher allows you to easily switch between different video sources instantly and broadcast to Ustream.tv, Justin.tv, Youtube, Skype, or anything.